At the end of the day, do you just feel like you can’t think another coherent thought? 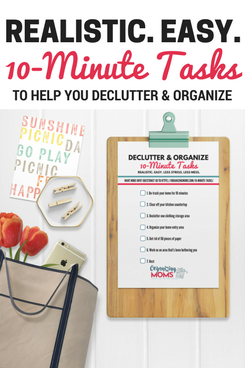 Are you super-busy and always reacting to all of the things that are piled onto your to-do list? 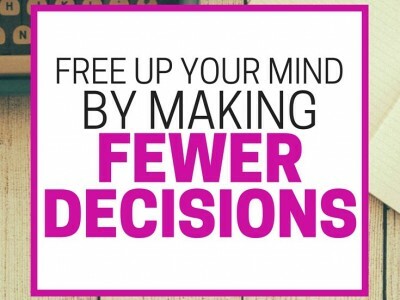 One way to feel less brain-dead at the end of the day is to make fewer decisions. Although the number of decisions you have to make in a day seems out of your own control, there are some things you can do to give your brain a break. Simplify your wardrobe, and plan out your outfits in advance. Did you know that Steve Jobs wore black turtlenecks every day so he didn’t have to think about what he was going to wear in the morning? By having a standard outfit, he made fewer decisions at the start of the day. You probably don’t want to be as extreme, but you could plan your outfits in advance to give your brain a break in the mornings. Or you could do a capsule wardrobe trial run to see if you could get by with fewer clothes. Turn off social media notifications on your phone and computer. Even if you ignore the notifications, you still have to make the decision to ignore them, which uses up a bit of brain power. If you get lots of notifications over the course of the day, that’s a lot of decision making! Create routines. When you establish a good routine or habit, you don’t have to think about it. If you get into the habit of doing something like unloading the dishwasher each morning while your kids eat breakfast, it becomes something you automatically do. Instead of spending time deciding whether or not to do unload the dishwasher, you do it as part of your routine, and don’t use up any precious decision-making energy. Automate what you can. Check around and see if any businesses in your area do regular deliveries. We have an affordable milk delivery service in our area that we use, and we no longer have to think about whether or not we need to pick up milk at the store. We’ve used Amazon’s Subscribe and Save program to have coffee, organic pizza sauce, toilet paper and even diapers sent to our house every few months. This saves time and decision-making power. Schedule your day. Depending on your season of life, this may or may not be possible. But, if you can sketch out a basic schedule for your day, and incorporate the things you’d like to get done, it saves you from having to figure out what to do next. If you’ve already planned out your day, you can consult your schedule instead of thinking through all of your options. By figuring out ways to put some of your regular decisions on auto-pilot, you can make fewer decisions throughout the day and free up some precious brain power. If you start making fewer decisions, you might still feel mentally exhausted at the end of the day, but you’ll probably start feeling less pressured and stressed. 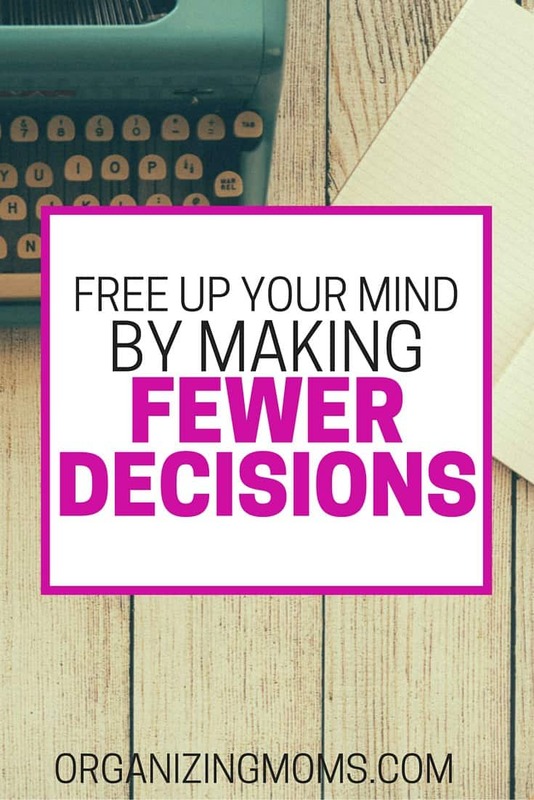 What are some things you do to make fewer decisions throughout the day? Please share your ideas with us in the comments!